Today was my weigh-in day. 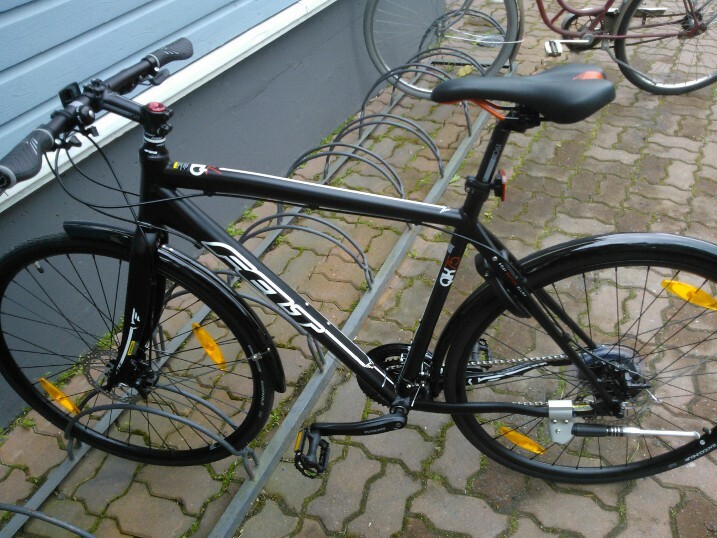 I made a promise to myself that if I’d be able to lose 20 kg, I’d buy myself a new bike. Well, I purchased the bike last week and today I reached that -20 kg! So I can be happy with my new bike. But will this be enough? No way. 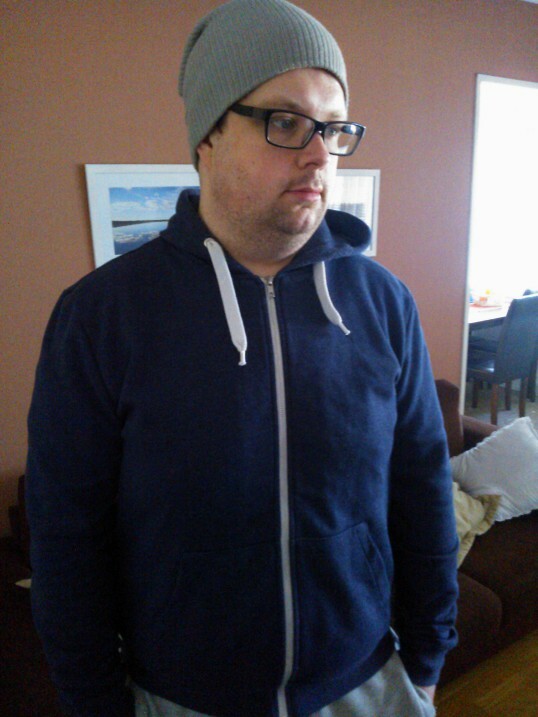 I set a new goal today, -30 kg in February 2014. This is totally achievable. What I’ve learned from our CrossTraining workouts is that the mind wins over matter, when you’re fully concentrated and willing, you’ll get that one more rep out of you. Also in general my new way of life has given me more determination and in general I feel good, better than in years – and this is just the beginning. After a weeks training of CrossTraining I already understand the effects what will become of those intensive training sessions. Strength, agility, endurance and speed all in the same package. I’ve also adapted a new way of thinking about my looks – I don’t care if I have a six pack or not, I just want to be able to do 20 pull-ups – when I’m 80. Being fit comes first, looks second. Luckily they tend to walk hand in hand (haha). Tomorrow I have the day off from work and feeling a slight DOMS after yesterdays workout, but not as much as I feared, maybe thanks to the foam roll I purchased, it’s so cool. I’m getting tomorrow some more results from my doctor, regarding my broken toes. I’ll found out how long I have to hold myself from running, but luckily I got that new bike. Take care guys and train hard! Today was the second day of our two day CrossTraining techniques class. Was feeling a bit tired and fatigued from yesterday (as you can tell from the picture) also I suffered a little bit of DOMS on my abs and back, but never the less I went for it. Day two was all about squatting and weights. Again it was somewhat interesting that the things that I thought I was doing right when squatting were actually all the wrong things. But it was nice to see the progress from yesterday that the instructions already had set in. Well not 100% of the time, but anyways. Nice warm-up, then some basic techniques with a stick, then slowly moving on to weight training, it was awesome. The thing that surprised me was that when I was doing the front squat, my hands didn’t have the required movement, this is something that I will work on. In the end we did this course of 15 mins which included 5 burpees, 10 wallballs (8kg) and 15 squats. Me and my friend did the course 4 times and after that we were exhausted, but we gave it all we had and the feeling was like nothing better, when you hear your trainers cheering and your partner supporting you to do that one last squat or burpee, you find that energy somewhere to hit that goal! Now there isn’t a single part of my body which isn’t aching, but I’m kind of liking the feeling never the less, it feels good to know that the weekend has brought something new and in general I learned a lot. Take it easy guys, will report on my way later on! Hello guys! I must apologize for a long pause between my posts, but now I’m back on track and will keep you updated what’s going on. There has been some things that have needed more my attention, so unfortunately the blog has suffered a bit. Anyways today was the day that I’ve been waiting for a while now. It was time to take my first steps toward CrossTraining and I had a technique training day at our local F.I.R.E. fitness gym. The instructors were both welcoming and assured that there was nothing to be afraid of, explaining that CrossTraining suites all, the exercises can be scaled up or down to suite each trainer. I was there with a friend and we were eager to learn more. The first warm-up was pretty nice, it was like back in high-school gym class, but the atmosphere in our group of 14 trainees was supportive and we all were there to improve ourselves and to support each other. Awesome. I generally think, that this is one of the key factors why CrossTraining is so popular around the world. Then it was squatting time. You know the feeling when you’re like “I know my stuff, I’ve been doing this x years”. And then you realize that all the years you’ve trained squatting you’ve been doing it wrong. Priceless. It was amazing to see that when you work with your hamstrings and glutes it actually makes squatting a whole lot easier on the knees and more effective all along. Can’t wait to actually train on some weights tomorrow! Then the thing I feared the most: Burpees. Instantly we got this hate/love relationship. But I can’t deny that they truly are effective and make you sweat. The plus side is also that the move itself is so effective that you actually activate your metabolism and fat-burn. I have to try this tonight as well. The whole class was amazing and we went through several techniques so that when we start doing our WODs we won’t get hurt. In the end we had this circle where we had to two different types of moves in pairs, 5 reps at a time for 1,5min. There were 8 different moves and I tried my limits and after doing that last box jump the feeling was amazing! It felt like I survived this, barely, but nevertheless. I truly feel that CrossTraining is what I want to do from now on, but also running and biking will be a major part of summer/fall routine. Will keep you updated on day two of our technique class tomorrow! Hey guys! It has been a while from my last post, sorry about that! It has been a bit hectic at times, but training has gone pretty good! Although I found myself cheating a bit when training biceps, but I will improve next week! This week I trained only twice at the gym because it was a busy week. But the workouts were quite good, especially my personal best on the crosstrainer, two uprising intervals for 40min HR being 160-max, the feeling was amazing when I finished, really felt like I am improving. Next week I will be doing longer concentration sets at the gym and I will add more cardio, been thinking of running 30-45min every morning (or at least 3-4 times) every week. Hopefully this will increase my air intake and endurance overall. Also it will amp up my weight loss, now it has been quite stable and I feel that I have gained lean muscle, because measurements have been going down, as weight has been stable. I thought about motivation also this week. Getting good feedback from family and friends is nice, but they have seen nothing yet. 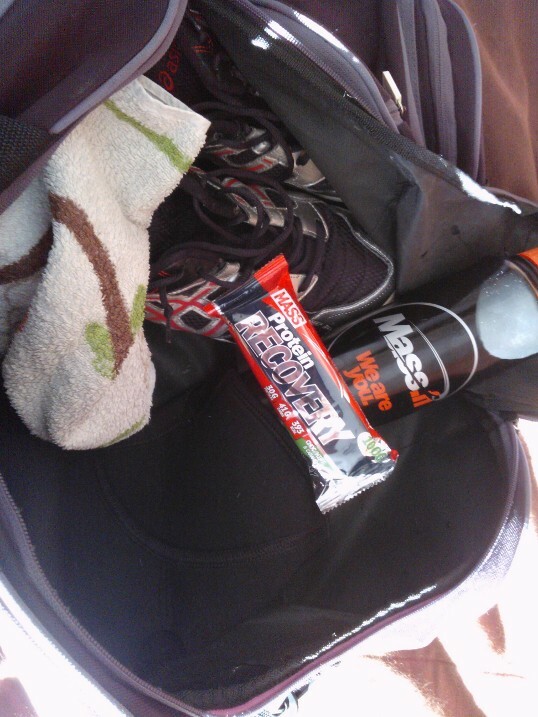 Lets amp up and hit those goals! Thanks for your support and please leave your comments, they are the best motivation! Yesterday I had quite a busy day with all the napping and stuff so I decided to add two workouts today! I am quite pleased with this weeks workouts, I had my doubts about this new regime, but it seems to be working. 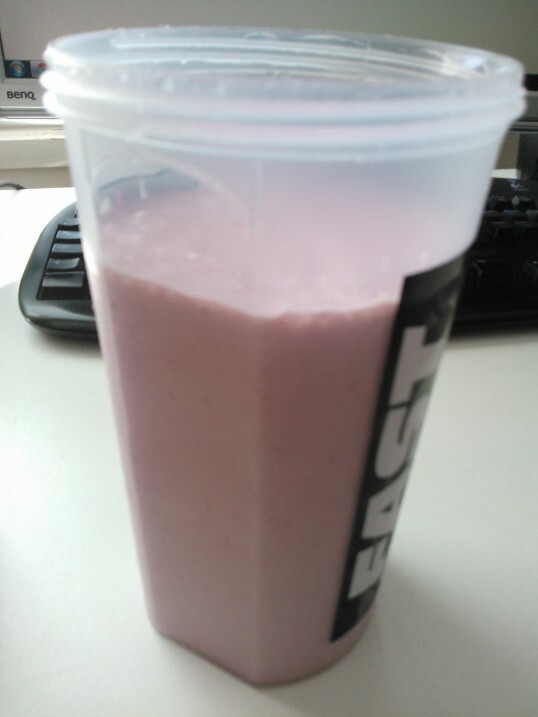 The smoothie: 25 g protein powder, quark, non-fat yoghurt, rasberries and oats. The main difference between this new program and the old one is that I train the whole body twice a week and I do the pyramid at the beginning of the week and longer sets with lower weights at the end of the week, this seems to be working for me and the recovery is much more easier this way. Anyways I’m feeling good about my diet and the weight seems to be stable now, maybe some muscle growth even? Never the less, I’m going to stick with this routine for 3 weeks and then add some more cardio (now doing it 1-2 times per week). Take it easy guys and happy Easter!